Agnes Deans Cameron (1863-1912) was born in Victoria, British Columbia to Jessie Cameron (nee Anderson) and Duncan Cameron. Cameron’s career in education spanned 1879-1906. She became the first female high school teacher in 1891 and the first female principal in 1894 in British Columbia’s public school system. In 1906, controversy ended her career in education and Cameron, already an accomplished writer, began her professional career in writing which focused on promoting the Canadian west. This inspired her to travel from Winnipeg to Herschel Island and back in 1908 with her niece Jessie Cameron Brown. Cameron is most known for her book documenting this adventure, "The New North", which was published in 1910. Cameron died in Victoria of pneumonia. Agnes Deans Cameron’s parents were both from Scotland. They independently immigrated to Sacramento California, her mother moving for adventure and her father for gold mining opportunities, and this is where they met. In 1860, the Cameron’s moved to Victoria BC to follow the Fraser River gold rush. 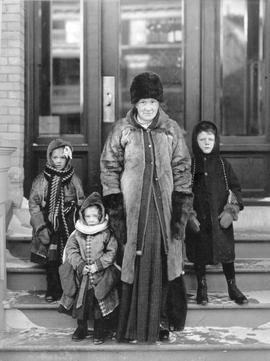 The family lived in James Bay, at the corner of Birdcage Walk (now Government St) and Superior St. Cameron was the youngest of five children: William, Charles, Margaret (d.), and Barbara who were born in Sacramento and Jessie who, like Agnes, was born in Victoria. There was no public school system in British Columbia until 1872 and the first high school was opened in Victoria in 1876. Cameron was among the first students to be accepted into the teacher’s training program at Victoria High School when it opened. She taught in British Columbia from 1879-1906, starting her career at Angela College, a private school in Victoria, before moving into the public school system where she taught at rural schools in Port Augusta (now Comox) and Hastings Mill in Burrard Inlet. In 1891, she was hired at Victoria High School where she taught third division, becoming the province’s first female high school teacher in the public school system. Cameron also became the province’s first female public school principal when she was hired at South Park Elementary in 1894. Cameron was a controversial figure in the public school system and clashed on more than one occasion with education officials. In 1901, Cameron fought the Board of School Trustees on a proposed pay raise for male assistant teacher but not for women. Cameron was featured in the Daily Colonist newspaper speaking out against the proposed wage disparity, however was unsuccessful in preventing it. Cameron became embroiled in public controversy again in 1905 when the students graduating from South Park elementary were accused of cheating in the technical drawing portion of their high school entrance exams. The exam evaluator gave zero marks for all of the drawing books submitted from South Park School. Cameron appealed this decision and was fired for insubordination with her teaching certificate suspended for three years. This decision led to public outcry from Victoria residents and as a result, the board asked for a Royal Commission of Inquiry into the issue which was adjudicated by Peter Secord Lampman in 1906. After analyzing the books and questioning the students and witnesses, the inquiry found in favour of the board. Cameron, who was already an accomplished writer, was able to support herself through her writing. Cameron began writing quite early in her life, writing for her high school newspaper and writing articles for the Daily Colonist and Victoria Times. She published her first short story, "Avatar of Jack Pemberton", in 1903 in the Pacific Monthly. Cameron joined the Women’s Press Club in 1906 and that year attended their annual meeting in Winnipeg. The Western Canadian Immigration Association (WCIA) sponsored part of this conference and took the participants on a trip through Alberta, Manitoba, and Saskatchewan. After their trip, Cameron was offered a job at the WCIA as an editor of the Canadian West Magazine and she moved to Chicago, where they were located. Cameron is best known for her book, "The New North", published in 1910, for which she gained international recognition. This book documents her six month trip to Herschel Island and back with her niece Jessie Cameron Brown. They booked their journey through the Hudson’s Bay Company and in 1908 they set off, travelling from Chicago to Winnipeg. From there they travelled to Edmonton by train and continued to Athabasca Landing (now Athabasca) by horse-drawn mail coach. They continued by boat up to Herschel Island in the Beaufort Sea via the Athabasca and Slave River, through Great Slave Lake to the Mackenzie River, then up to the Beaufort Sea. Cameron and Brown took many photographs and collected samples of the local vegetation during their trip. Cameron wrote of her travels, describing in detail the places she went, the landscape, natural resources available, wild life in the area, the people she met, and the industries such as whaling and sealing. Their return trip took them through the Peace River to Fort Vermilion, Peace River Crossing, Lesser Slave Lake, then back to Winnipeg. In her personal life, Cameron was an avid traveller, athlete, and activist. She travelled to places like Chicago, San Francisco, and the Hawaiian Islands. She became the first female Centurion, cycling a hundred mile course within the specified time limit. Cameron was also an activist for women’s rights, writing articles and giving lectures to fight for women’s right to vote, to equal pay, to enter the same professions as men, and to be recognized as equal citizens. She belonged to many women’s groups such as the Council of Women of Victoria and Vancouver Island, British Columbia Women’s Council, Canadian Women’s Press Club, Ladies of the Maccabees, YWCA, Woman’s Christian Temperance Union, and the National Council of Women of Canada. In 1912, Cameron was diagnosed with appendicitis and admitted to St Joseph’s Hospital where she underwent surgery, later catching pneumonia. She died a few days later at the age of 49. The fonds consists of Cameron's photographs of various of her activities. The works of several photographers are present in this collection, including studio portraits, field photographs and composite works marketed by Victoria based Mrs. R. Maynard’s Photographic Gallery (1862? to 1912). Some photographs may contain culturally sensitive information. For conservation reasons, access provided to originals is limited. Researchers should consult online reference images prior to consulting the original. Please contact the BC Archives to determine the access status of these collection materials. Some photographs may contain culturally sensitive information. Please contact the BC Archives to determine the use, reproduction, and publication status of collection materials. Item descriptions are available for digitized materials. For materials relating to the photographic works of Hannah Maynard, Richard Maynard and Mrs. R. Maynard’s Photographic Gallery, see PR-1259 Maynard family collection. Outdated historical terms are present in this collection used to identify people and lifeways of non-Anglo European ancestry. Additional documentation (Maynard family research files) is available. 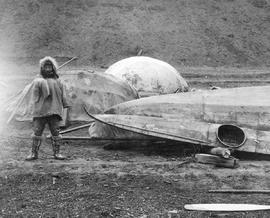 The Maynard family research files contain information and records relating to the Maynard Studio as well as related photographic works depicting Indigenous communities, including field photography captured in Alaska present in this collection. These files were created by current and past staff and researchers of BC Archives and includes biographical, contextual, and photographic research information. Please contact the BC Archives to determine the access status of these records.